Crowdfunding has emerged as a viable alternative for entrepreneurs to raise capital for their business, or specific products and activities. It involves reaching out to individuals and pooling all the resources for your campaign, whether the contribution is only for $5 or $5,000. Understand that crowdfunding is different from handouts: you need to offer something in return for people to support you. Know that people are not going to donate out of the goodness of their hearts. Always ask yourself: “When a prospective investor comes across your campaign, will you have a sufficient answer to the question – What’s in it for me?” because they would want to have something in return! Public perception is everything in crowdfunding: you need to know how to communicate your offers well and tap their emotions to compel them to reach to their wallets and give you their hard-earned cash. Recognize that crowdfunding is not going to work for everyone and for all types of business: a business creating a mobile game app may attract may be able to successfully raise funds through crowdfunding rather than a daycare business. aving a tangible end-product (e.g. film, invention, etc) can generate more excitement than services. Prepare your plan for the whole project, and not just the crowdfunding aspect. Your plan should include the steps you need to take to develop the product, and timelines, among others. More importantly, you need to consider alternative source of capital in the event that crowdfunding will not work. Be sure to work out your budget for your project even before you start. Identify your target market both in terms of who will benefit from the output of your campaign to possible supporters. Prepare to tell your story – as your story will sell your campaign. Perfect your pitch to make sure it resonates with prospective investors. They need to be convinced that they are going to miss out something big if they do not donate. Choose the best crowdfunding platform for you, as some platforms may be better for your project. Remember, the success of your campaign depends on the demand you create for it, and not necessarily putting your campaign to all platforms that you can find. 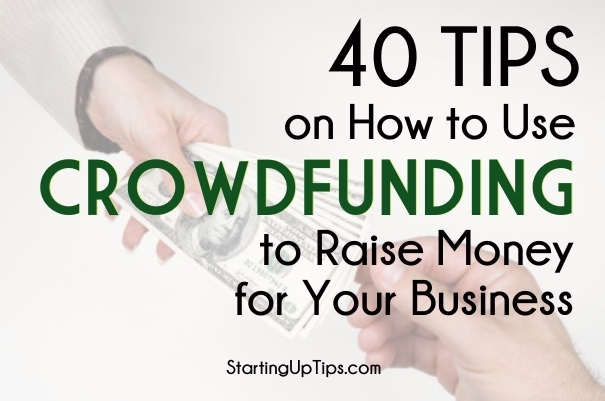 Learn the policies and guidelines of the crowdfunding sites that you will use, particularly fees. Show proof of the legitimacy of your business. People don’t like to be scammed and conned, so they need to see that you are a real business with a real product. Decide on the right length of time for your crowdfunding campaign: you don’t want it to be too short where you’re unable to provide updates to supporters; yet you don’t want it to be too long that everything drags too slowly. The ideal time may be 2-3 weeks with updates once or thrice a week. Offer value in your rewards and make them compelling: only your friends will donate to you if your rewards offer no value. Use a tier system for your rewards in terms of value: the more money they donate, the better the reward should be so give them an incentive to give you more money. Engage your network (friends, family, social media connections) early and let them know you are planning to launch a crowdfunding campaign – before you even start. Find high profile or influential individuals to endorse and talk about your campaign. You’d be surprised at the speed of how your campaign will grow if people know that someone they know and admire believe in you and in your campaign. Promote your pitch daily, both in and outside the crowdfunding platform: just because you posted your pitch on a crowdfunding site does not mean that prospective investors will see it. Post regular updates about how your project is coming along, and get everyone excited all over again about your campaign (who knows, those who gave earlier may increase their pledge to you). Create a pitch video where you explain who you are and what you are trying to accomplish. Personal touch works, and videos are a powerful marketing tool for your crowdfunding campaign. Fulfill your promise and be sure to send out the rewards you promised your supporters. Be sure to express your gratitude to your supporters and those who shared your campaign.